Your first job can teach you tons. Including what you don’t want in a job. It’s all about the life lessons. When I graduated from college, I was lucky enough to find work with a newspaper. I wasn’t supposed to be picky about it. I hated my first job, but it was only until I left that I realized I learned a lot of things about myself while I was there. Not every job will be your favorite, but there are tons of things you can learn about yourself and what you need while you’re there. The worst experience can teach you more about yourself in a year than you’d learn anywhere else. 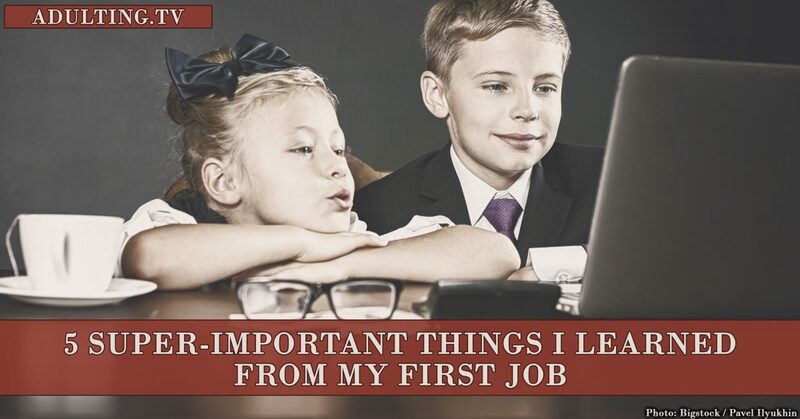 Here are the five best things I learned from my first job, and why I’m still grateful for that opportunity. I learned to pay my dues. Like every newspaper, we were open during the holidays. Reporters signed up for holiday assignments on a first-come, first-served basis. The longest-standing reporter got his or her first pick, then the second-oldest reporter got to choose and so on. Since I was the newest staff member, I had to work whatever holiday was left: Thanksgiving. The longest-standing reporter got his or her first pick, then the second-oldest reporter got to choose and so on. Since I was the newest staff member, I had to work whatever holiday was left: Thanksgiving. I remember being crushed that I wouldn’t be able to spend Thanksgiving day with my family. I drove down to my boyfriend’s family’s Thanksgiving at 10 p.m. and left early the next day. That Thanksgiving was hard, but it taught me that I wasn’t special or entitled. I wouldn’t get any special privileges, and I had to put in the time and effort to get the benefits I wanted. I learned to trust my gut. Before I got my first job, I was hesitant about entering the newspaper business. I knew I was more interested in magazines, but those jobs were scarce. I figured I was better off taking the first job offer I got instead of holding out for a magazine gig. As soon as I got there, I realized I’d made a huge mistake. Anyone who’s had a job knows that the first day is mainly filled with HR paperwork and meeting new people. The first day is the best. No one expects you to do any real work, your new boss usually buys you lunch, and you can head home early. None of those things happened my first day. That’s how I knew I was screwed. I couldn’t even enjoy that first day. After that, I learned to trust my gut more instead of making the rational choice. I learned what I wanted out of a job. Before I started my first job, I thought I wanted to work a regular 9-to-5 schedule like everyone else. But that job solidified those feelings for me. At first, I worked 9-to-5 with occasional weekend or holiday assignments. After a few months, our night cops reporter left, and my editor asked if I could take over his shift. I started working from 2 p.m. to 10 p.m., Monday through Friday. Suddenly, my social calendar was ruined, since none of my coworkers and friends worked in the evenings. I was also driving every Friday to see my boyfriend, who lived three hours away. Now that my workday ended at 10 p.m., I got into his city at 1 a.m. I hated working when everyone else wasn’t. Even when I wanted to call my parents back home, I had to do it while they were at work or wait until my break. Working nights made me averse to working any sort of unusual schedule. During my next job search, I only sought positions where weekend or night work was minimal. I learned to find something I care about. During my newspaper gig, I reported on fires, car accidents, and the occasional murder. Most of the stories were similar, and I could find few ways to differentiate between one car accident and the next. At the time, I was getting more interested in being frugal and saving money. I convinced my boss to let me start a blog chronicling my money-saving tips. It was the highlight of my day, and I continued blogging about money when I left. Even in a job that I hated at times, I learned how to carve out a little piece of it that I loved. I learned I wanted more autonomy. As a young reporter, I had little say on what stories I wrote. The editors made the assignments, and I followed through. This is standard at most newspapers. I’m sure even a young Woodward and Bernstein weren’t telling their editor what they wanted to write about. Before that job, I didn’t think of myself as a self-starter. But I quickly learned that I wanted to be in charge of my day. In my next gig, I had more responsibilities and could tell my bosses what I thought we should be doing. I loved having that type of independence. Now that I’m a full-time freelance writer, I get to direct how my day goes. And I love it. Don’t assume that you can’t learn something from your first job, even if it’s something you hate. Take every job as a learning opportunity and you’ll be more successful down the road.